This story contains spoilers for Marvel’s Black Panther. Erik Killmonger (Michael B. Jordan) has a vendetta against Wakanda. Though his father, N’Jobu (Sterling K. Brown), was a member of one of Wakanda’s royal families, Killmonger was left fatherless and poor in Oakland, California without access to the wealth, power, resources, and support that he believes he’s owed. So, Killmonger embarks on a misguided mission to become the king of Wakanda so he can arm Black people across the diaspora with Vibranium, a rare and powerful metal that Wakandians own and use in their technology and weapons. 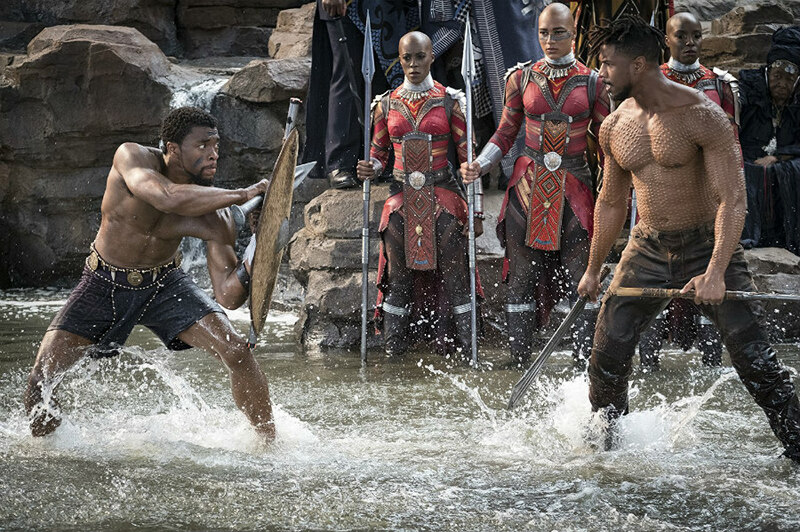 Through consistent references to colonialism, the Transatlantic slave trade, and white people taking what doesn’t belong to them, it’s clear that Killmonger is supposed to be Black Panther’s revolutionary—diametrically opposed to T’Challa (Chadwick Boseman), the measured, calm, and thoughtful Black Panther who protects Wakanda through purposeful isolation. In an illuminating Twitter thread, Dr. Tanisha Ford, a history and Africana Studies professor at the University of Delaware and author of Liberated Threads: Black Women, Style, and the Global Politics of Soul, drew a stark connection between the sartorial choices for Killmonger and Bishop, a character Tupac Shakur played in the 1992 film Juice. Nothing happens accidentally in Black Panther, and that includes the overt references to revolutionary leaders, like Huey P. Newton, and rebellious characters, like Bishop. While Killmonger is hyper-aware of the irreversible impact of colonialism on people of color—and understands that uprisings lead to the shifting of systems—he has evolved into the very imperialists who he despises. Killmonger is a killing machine who honed his chops in the United States military, helped America invade Iraq, and worked with a special ops team to purposefully destabilize countries—as the United States has done around the world. He prides himself on the murders he’s committed, marking his body over and over again to signify each life he’s taken. Killmonger’s not, as Wakandan general Okoye (Danai Gurira) tells him, fit to be king. After all, he kills his girlfriend, Linda (Nabiyah Be), when she becomes a liability to his mission. He also mistreats many of the women he encounters, both within and outside of Wakanda, because they’re simply collateral damage in his plot to reshape the world’s power dynamics. It doesn’t matter if he has to slice their throats or scream at them to burn fields that guarantee the survival of Wakanda. In his quest for power, everybody becomes an obstacle that he must overcome. It’s a departure from the collective power that’s enabled to Wakanda to thrive outside of colonial control for centuries. T’Challa understands that women, particularly Wakandan women, are integral to the country’s survival. Okoye’s sword and T’Challa’s Vibranium-infused panther suit were created with precision by Shuri (played by the charming Letitia Wright), who’s Wakanda’s chief scientist and second-in-line to the throne. Shuri is witty-as-hell (“Don’t scare me like that, colonizer” and “Another broken white boy to fix” became instant classics), but she’s also a warrior who’s willing to die to protect Wakanda. From the outset, Nakia (Lupita Nyong’o) is situated as an equal to both Okoye and Shuri. Though T’Challa would prefer that Nakia become his wife and remain in Wakanda, she’s one of the country’s most-trusted spies, and we meet her as she’s working undercover to free Chibok women who’ve been kidnapped. She fights ivory traders and infiltrates terrorist groups to keep Wakanda abreast of what’s happening around the world, and also, to gain the knowledge she needs to make her case for spreading Wakanda’s good fortune. Nakia is equally-as-invested as Killmonger in using Wakanda’s advanced technology and other resources to help oppressed people around the world. However, her methods are starkly different because she understands that liberation can’t be predicated on the oppression of others. Instead of wreaking havoc, Nakia is leaning on T’Challa to open the borders of Wakanda to refugees while also providing foreign aid to other countries. Kilmonger wants to use advanced weaponry to ignite a revolution so that Black people can conquer those who are different and “come out on top.” Is that freedom? Or is that a new iteration of the master’s tools? Okoye, Shuri, and Nakia inherently understand that Wakanda is bigger than their individual contributions, and they can only retain their sovereignty if they work together. These women are Black Panther’s true revolutionaries. For all of the greatness that Marvel has produced, it has never figured out how to present well-developed, multidimensional, and compelling female characters who don’t exist to serve the arc of male characters. There’s no shortage of these characters for Marvel to choose from: Storm, who’s been played by both Halle Berry and Alexandra Shipp, has appeared in multiple films, including X-Men: Apocalypse, but the weather-changing mutant has never been in a standalone film. Similarly, Black Widow (Scarlett Johansson) was integral to multiple ensemble films, including Captain America: Winter Soldier, but was simultaneously shamed for having romantic relationships with multiple members of The Avengers team. After the success of DC and Warner Bros.’ Wonder Woman, Marvel is moving ahead with Black Widow and Captain Marvel movies in hopes of reversing course. By presenting T’Challa, the first African superhero, Marvel is realizing there’s a domestic and global market for superheroes of color who don’t shy away from addressing issues of identity. In the process, though, Marvel coincidentally offered a blueprint for how to present female warriors—heroes without superpowers—who exist outside of the male character at the center of the film. Black Panther succeeds because so much of the movie stems from the wonderment of Wakanda’s rituals and customs. When T’Challa is preparing to become the king of Wakanda, he welcomes challengers from others with a blood-right to the throne. Fighting for the crown is a masculine endeavor, but T’Challa puts his trust in women. He trusts women to counsel him. He trusts women to protect him. He trusts women to develop the technology that he uses in his battles. And he trusts his ancestors to guide him. When T’Challa officially becomes king and Black Panther, he’s buried so he can reunite with those who’ve come before him. He is buried to be born anew. It’s a sacred ritual that’s only possible because director Coogler takes Wakanda and his Black superheroes seriously. T’Challa isn’t an alien-turned-superhero. He’s not a vain millionaire who believes fighting crime is his calling. He’s a protector of Wakanda. He understands that Wakanda is better when women are integral to its infrastructure. Killmonger is a villain who we’re supposed to cheer for. He leads a much-needed intraracial conversation, but his revolution is exclusionary. What the women of Wakanda show us is that revolution must include all of us to lead to freedom. 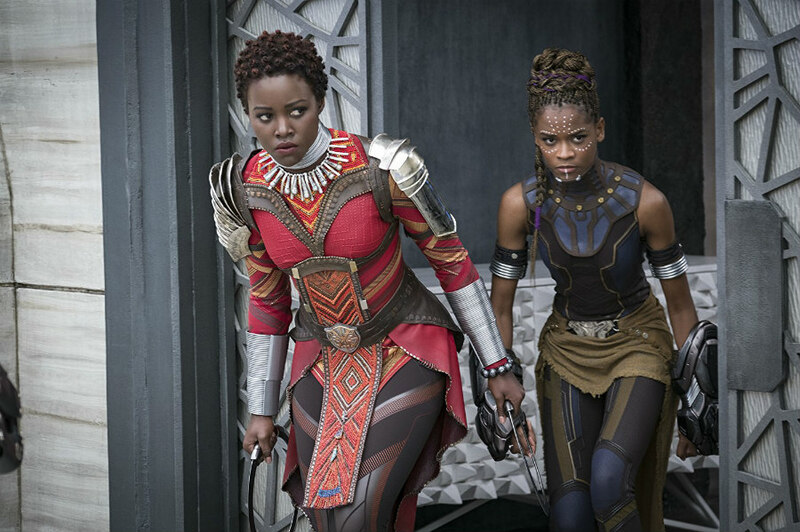 Long live the queens of Wakanda for they will show us—and Marvel—the way forward. This story has been updated to reflect that Killmonger and W’Kabi are not brothers. It was "liberating" to play a role that didn't focus on her body, says Nyong'o.